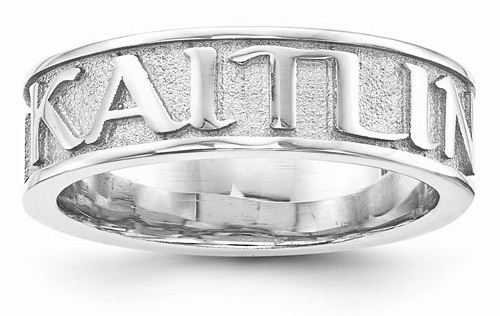 We start with a sandblasted .925 sterling silver band and customize the ring with your name of choice. Ring weighs approx. 5.12 grams and is available in sizes 5-9. Our custom band is made and personalized right here in the U.S.A. for finest quality craftsmanship. Also available in 14k yellow gold, which is shown below. We guarantee our Sandblasted Custom Personalized Name Band Ring in Sterling Silver to be high quality, authentic jewelry, as described above.